The original Kintaikyo, Iwakuni, Japan Bridge was built in 1673 and didn't stand very long until it was damaged due to flooding. It was then rebuilt and survived for more than 200 years until a typhoon battered it to death in 1950. 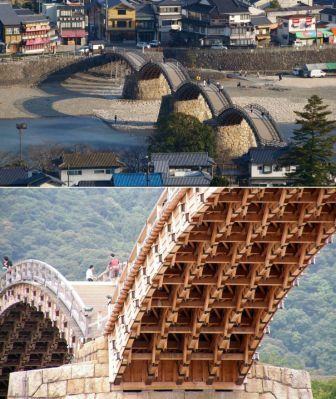 The bridge that stands now over the Nishiki River is the 3rd build and looks magnificent, it's 5 wooden arches displaying an incredible amount of detail and craftmanship. Interesting fact: no nails or bolts have been used to build the arches, only clamps and wires.